Saturday October 25th, 4pm-6pm: Local author, Dr. Hugh Wilson, will be in Old Capitol Books to sign copies of his novel which explores Scotland on the eve on World War II. 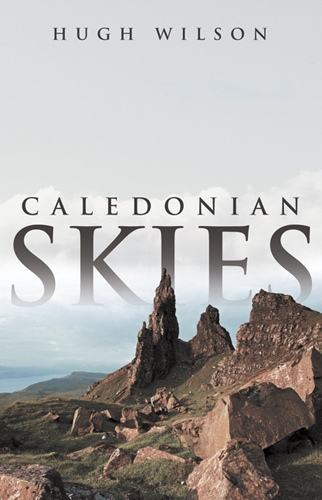 Fusing his own passion and imagination with facets of his parents’ experiences in World War II Scotland, Hugh Wilson’s ‘Caledonian Skies’ sends readers to 1930s Britain, to embark on a journey that could change history and preserve the safety and security of the world. ‘Caledonian Skies’ is a compelling narrative that is wholly unique and previously unwritten. February of 1939; International tensions are at an all-time high, and there is little trust in Germany’s new leader as Ian Mackay, a decorated Royal Flying Corps ace of the Great War, settles atop the mountain, Ben Lomond, to watch the sunrise. Shortly, Ian observes what he believes is an experimental German reconnaissance airplane spying on Scotland. But there are no other witnesses, and the rudimentary radar of the day is unreliable. Ian is driven to report what he has seen. Military intelligence officials are skeptical but agree to send Ian on an intelligence mission to investigate the German aircraft. Ian, alone at forty-two after losing his one and only love years ago, embarks on a perilous journey. With a cyanide capsule safely tucked away in his pocket, Ian only hopes he will never have to use it. Dr. Hugh Wilson is an American-born son of Scottish immigrants. He earned his undergraduate degree with highest honors in cell biology from the University of California, Santa Barbara and later earned his medical degree. For more than 20 years, Dr. Wilson has practiced surgical pathology in Monterey County, California. Dr. Wilson first began writing in his early thirties shortly after completing all his medical training but only recently published his first novel. Get Email Updates from Old Capitol Books! JERROLD LOMAX ARCHITECTURE BOOKS HAVE ARRIVED! !